This is the place for fun + games and bar food done right! Jody Hessler has been around the local bar scene for a while, managing beverage programs and tending bar at popular spots such as Chef Geoff's, The Hamilton and Copperwood Tavern. He's seen a lot, and he knows what works and what doesn't. As operations director at Quinn's on the Corner, one of Rosslyn's liveliest neighborhood bars, he's using his experience to help make Quinn's a place where you can "goof off and just have a good time." So, when you go to Quinn's you can do a shotski with your friends. Or a Jell-O shot. Or even a pickleback! You can partake of a delicious frozée. Or their Killer Cocktail of the Month in a souvenir stadium cup. 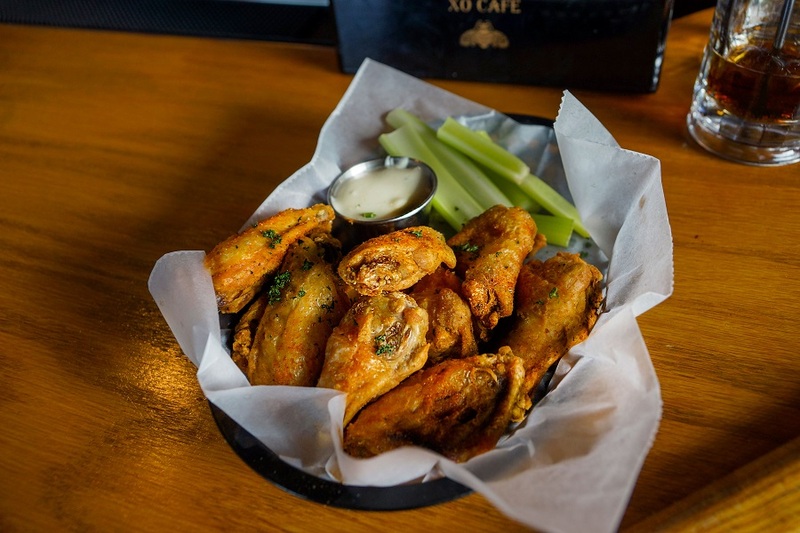 Monday is Wing Night, featuring 50 cent wings from 8 p.m.-12 a.m.
On Taco Tuesday, you can get a great deal on two tacos, chips 'n salsa and a draft beer. Wednesday is Trivia Night with Pour House Trivia. Quinn's gives away nearly $1,000 in gift cards that night! 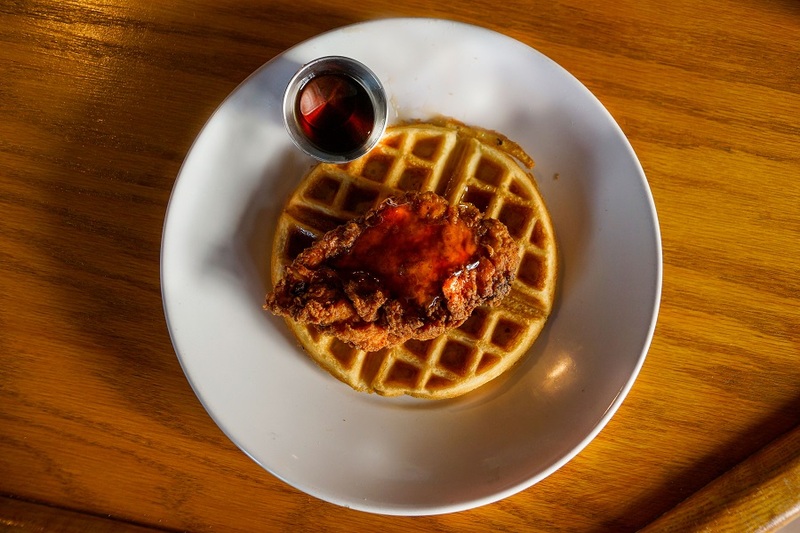 On Saturday and Sunday, Quinn's offer's the longest brunch in Arlington, served 10 a.m.-5 p.m. Enjoy traditional brunch fare, such as eggs benedict, chicken and waffles, and steak and eggs as well as some lighter options like avocado toast and salads. Quinn's also offers an amazing deal on champagne during brunch. You can use it to mix Bellinis or Mimosas at your table with a carafe of O.J., grapefruit juice or peach juice. We visited Quinn's early in March to sample some dishes from their menu. 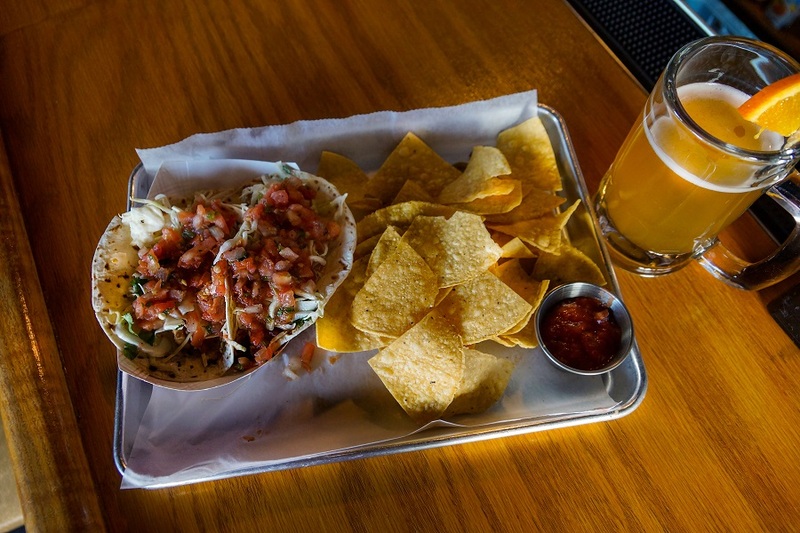 They serve fresh, high-quality food, and this is where Quinn's goes beyond being just another neighborhood watering hole: It definitely feels like a fun place, but the food is good, too! It's well-prepared, classic American bar fare. A dish from the brunch menu, the chicken and waffles is delicious, and we all eagerly dig into it. We're wowed by how fluffy and light the waffle is. It's topped with a fried boneless chicken breast. The chicken is nicely cooked: crispy on the outside but very juicy on the inside. Topped with sweet maple syrup, this dish offers a nice contrast of flavors and textures. Quinn's serves wings four different ways: mild, hot, Old Bay and barbecue. They arrive in a large basket and our first impression is that these are some huge, meaty wings—mostly mini-drumsticks. Ours are dusted with Old Bay and served with a tasty dipping sauce. We're picky about our wings and we love these. They're plump and tender, and the Old Bay adds just the right amount of spice. 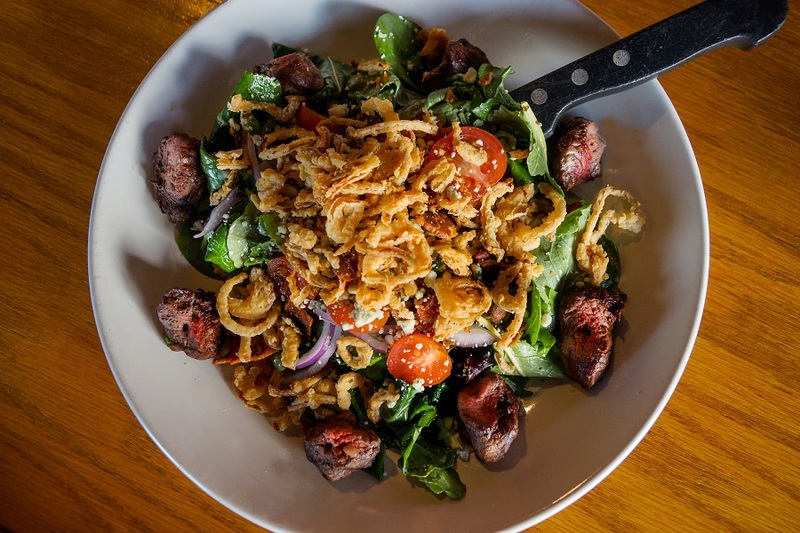 Our steak salad looks formidable and satisfying. This is definitely a salad for people who think salads aren't filling enough for a meal. The steak is well seasoned and cooked medium rare, just the way we like it. Besides having ultra-fresh greens and juicy tomatoes, this dish is served with a wonderful, creamy ranch dressing that's made in-house. It's topped with blue cheese and crispy fried onions that are perfectly cooked and not at all greasy. Unless you're not a red meat-eater, we think it's be hard not to like this salad. Really good! We all like our comforting meatball subs, and this one definitely works. We absolutely love the baguette it's served on: It's fresh, soft and chewy, making it the perfect vehicle for Quinn's house-made meatballs. Tender and moist, they could've been made by someone's Italian grandma. The marinara sauce is tangy and has a nice zing to it, definitely contributing to the sub's overall flavor. 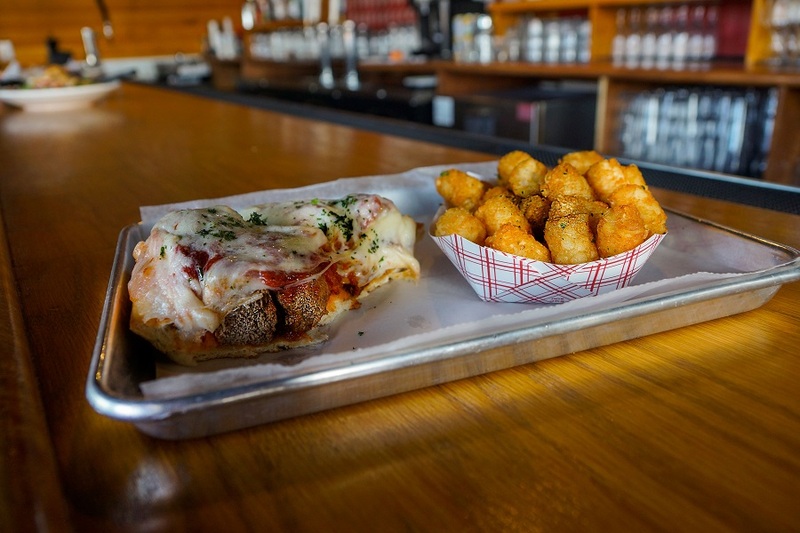 It's served with crispy tator tots—the perfect accompaniment! Our chicken tacos feature tender chunks of meat, cilantro slaw, shredded cheddar and pico de gallo stuffed inside two flour tortillas. We all agree the pico de gallo is excellent, with just the right amount of kick. The chicken is moist and tasty, and we love the delicious chipotle crema we taste when we bite into them. We'll definitely come back to enjoy these again during Taco Tuesday! If you're looking for a fun outing with your friends, be sure to drop by Quinn's for weekend brunch or happy hour. As the weather gets warmer, you'll enjoy the chance to sit outdoors on their patio, too! Quinn's has some awesome events planned in the coming months: March Madness viewing parties, a St. Paddy's Day party on March 17 and an Easter celebration featuring Bubbles + Bunnies that will be kid and dog friendly. You can sign up to receive their weekly e-newsletter at the bottom of their homepage. It'll provide you with all the details. Quinn's will give you a $15 gift card just for signing up! Photo at top: Some of the dishes we sampled during our tasting at Quinn's on the Corner included (clockwise, L to R): a meatball sub, wings, chicken tacos, a cheesesteak and a steak salad.